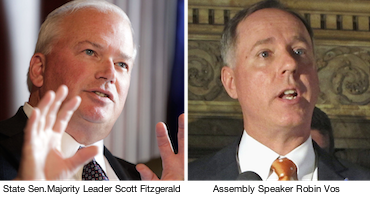 In what can only be described as a a blatant attempt to exercise raw political muscle and further undermine citizen confidence in the integrity of the administration of Wisconsin's elections, ethics and campaign finance law, State Senate Majority Leader Scott Fitzgerald (R-Juneau) and State Assembly Speaker Robin Vos (R-Rochester) have "teamed up" to remove the current WI Elections Administrator Mike Haas, and WI Ethics Administrator Brian Bell. Why are they being attacked? Apparently the fact that Haas and Bell have the unanimous bipartisan support of the political appointees to each of their Commissions for their competence and impartiality angers Fitzgerald and Vos. They want more partisan, unbalanced conduct of elections, ethics and campaign finance law in their ongoing quest to transform Wisconsin into an utterly one-party state – with the Senate Majority Leader and the Assembly Speaker in complete control. Two years ago, Fitzgerald and Vos masterminded the destruction of the effective, nationally-admired, scrupulously non-partisan Wisconsin Government Accountability Board that, from 2008 to 2015, served all of the the citizens of Wisconsin in a fair, effective and lawful manner – investigating corruption and crime wherever it was detected and conducting elections and administering ethics laws in a way that Wisconsinites could have confidence in, and respect for. Fitzgerald and Vos also oversaw the "carve out" (for politicians only), of an exemption from the state's 170-year-old "John Doe" investigatory process in order that political corruption could no longer be effectively investigated and prosecuted. And Fitzgerald and Vos championed the re-write of Wisconsin's campaign finance laws in 2015, once among the best in the nation, so that they are now among the weakest and least transparent. And they legalized the corrupt practice of campaign coordination between candidates and outside, supposedly "independent" special interest groups like Wisconsin Club for Growth during elections. No state in the nation has gone as far to legitimize this type of corrupt collusion as Fitzgerald and Vos have done in Wisconsin. And now, they are moving to remove Mike Haas and Brian Bell because these two highly competent, fair-minded and impartial civil servants were employed by the now-dissolved Government Accountability Board and are not the hyper-partisan sycophants that Fitzgerald and Vos want in place for the upcoming 2018 election season. Fitzgerald has scheduled a vote in the Wisconsin State Senate for Tuesday, January 23rd to deny the confirmation of Haas and Bell for their current positions and to remove them. Wisconsin citizens need to rise up and defeat this insidious partisan power grab and demand that their State Senators vote against Fitzgerald and for the confirmation of Mike Haas and Brian Bell as Administrators of the Wisconsin Elections and Wisconsin Ethics Commissions, respectively. CC/WI will join other reformers in a press conference in the Capitol on Wednesday, January 17th on this critical matter. But the time for you to act is now. To contact your State Senator, go here. If you are not sure who your State Senator is, go here. Also, contact both Scott Fitzgerald and Robin Vos and tell them to lay off trying to muscle Mike Haas and Brian Bell out of their jobs. Read this recent guest opinion editorial from CC/WI and the League of Women Voters of WI about this critical issue. Read this letter from state good government groups, including CC/WI, to Fitzgerald, Vos and Wisconsin State Senators about this issue. Read this powerful Wisconsin State Journal editorial against Fitzgerald and Vos's power grab. Then, when you have taken this action, contact five or ten friends and family members and tell them to do the same! Please share this message widely. Let's make sure Fitzgerald and Vos know we are mad as hell and we aren't going to "take it" anymore. Unjust and Unwarranted Attack by Fitzgerald and Vos on State Elections and Ethics Administrators Tweet this!